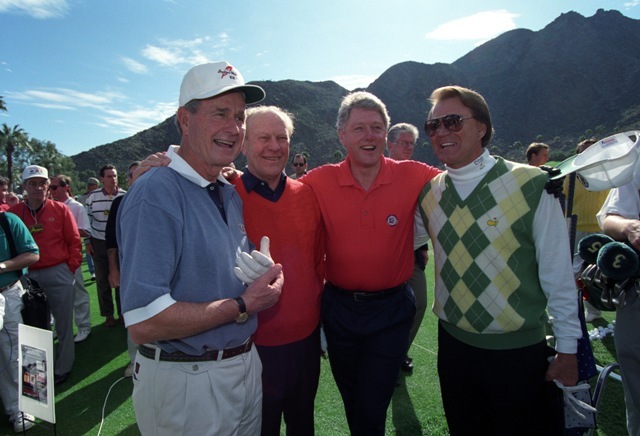 Glen Campbell, Bill Clinton, Gerald Ford, and George H. W. Bush after playing a round of golf at the Bob Hope Chrysler Classic in California (February 15, 1995). Kim and Ashley Campbell attended the Alzheimer's Association "Forget Me Not" Gala in New York on June 8. Here's a picture of them together with Jesse Olson, one of Glen's grandchildren (eldest son of Debby Campbell). Wonderful picture. Thanks for sharing arlw! You are correct Dee. That is when the picture was taken.. 1974...that's the year I started my collection so it makes me smile too!.Thank you..
arlw asked me to post this picture from her Glen Campbell collection. Its original size is that of a poster: 16 x 20! I believe this photo was a press photo distributed for "Glen Campbell and the Musical West", a special television program in the U.S. that aired in 1974. Is this info correct, arlw? Thanks so much for sharing this great picture! I can't help but smile when I look at it! Be sure to read the comment by photographer Henry Dilz, below the picture. Nice pic of Kim, Ashley, Cal Campbell and James Keach and Julian Raymond. This was taken at the Oscar Ceremony? Cool pic of Glen and Waylon Jennings, from Debby Campbell's Facebook page. Siblis, those are from a Shindig show. If you click on View Image, you'll see the full description on the Getty website. Donna Loren and Jackie Wilson are some of the other performers. Jay, thanks! I now see the cut-out at the headstock. Question of course is, was he plugged in?